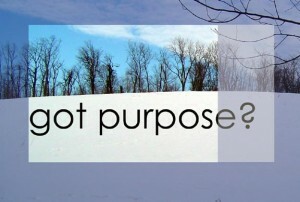 What good is passion without purpose? 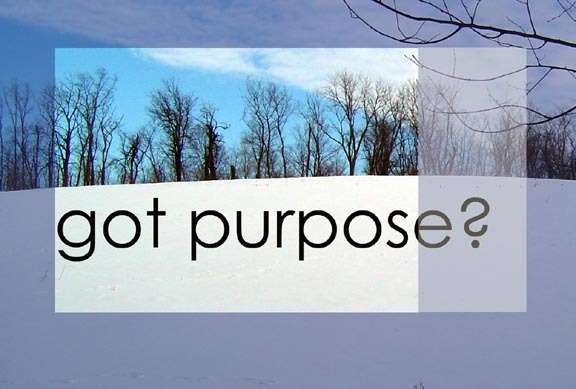 Are you really clear about your purpose in life? Looking back, my biggest discovery in 2013 was that I was not clear and didn’t even know it. There is a lot to celebrate and remember for 2013. Sitting here and letting the bigger learnings bubble up into consciousness, I would say that 2013 was a year in which purpose and passion became clearer and stronger. 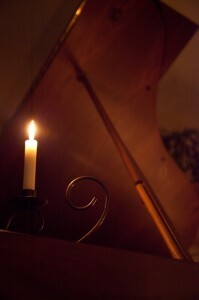 It’s a little odd for me to sit with that because I am a person who has always been passionate about music and beauty. I know they make a difference for people. “Me – not clear about my purpose?! ” But, when I look at what’s so, that clarity of purpose has been hazy and haphazard over the past years. I’ve been egotistical in my firm belief and arrogance about being a person with passion and purpose. There’s been a little of the “Thank goodness I have my passion” and “I feel so sorry for you poor souls who don’t”. Well passion with purpose is very different than passion without purpose. Or perhaps, it is more accurate to say passion without considered and clarified purpose. The result has been a tug o war between moving towards a desired goal and then being pulled away from it. Then another and another. The results: pale versions of what’s really possible, disappointment, and a healthy dose of resignation. But this past year purpose has blossomed for me. I don’t think the flower bud is fully open yet, but it’s looking very beautiful these days. The results of 2013 sometimes arose out of actions which then revealed the purpose. Sometimes an identified or clarified purpose then revealed the actions to take. For me, music serves so many purposes. It even provides things for others I do not seek out. Music can be both entertaining and heartbreaking, uplifting and gloomy, invigorating and relaxing, abstract and descriptive, emotional and rational. It provides a path for individual expression and communal expression. It can be inclusive and divisive. I like almost all these aspects of music and express them at some point or other as I carry out my musical activities. But this has been one of the problems. I’ve been thinking I have to do it all and this year I discovered I don’t have to. My purpose, my reason for being a musician, is to provide nurturing and healing for listeners and myself. This is why I have always done music. First it was just for myself as I passed through those difficult years as a teenager which were fraught with the deep humiliation and embarrassment of being bullied. Our difficulties force us to find solutions. My solution was art and music and I became a master at using them to provide peace, healing and fulfillment. Now it’s really simple – my role is to provide the same for others regardless of the source of pain or unease. It’s a kind of crazy ah ha moment given I’ve been doing exactly that for years. But the thing is, I’ve never consciously owned it until just this past year. This year, I had the profound honour and privilege of providing Under the Piano for a number of people dealing with grief and loss – couples with stillborn babies, people who have lost their life partners, children, siblings or friends. To provide the healing power of an Under the Piano session for these people and to witness the beneficial results it provided for them is the single most profoundly fulfilling thing I’ve experienced in the past year. In 2013, we also launched Quiet Hearts – musical respites and journeys. At first, Howard, Mark and I thought these were meant to be musical meditations featuring soothing and relaxing music. They are that, by and large, but something else emerged. Music, when it comes right down to it, simply and powerfully deals with the palette of emotions like no other art form. So the purpose emerged out of the action of playing every week and then listening to what the listeners were getting for themselves. We saw that they were really emotional journeys rather than meditations. Numerous people have approached us to share how their hearts have been filled by these experiences, many times to the point of tears. Music lets us have emotions in a way that is safe – we are allowed to be emotional with music. That is Quiet Hearts’ purpose. It’s also an amazing journey and expression of improvised creativity, but that is simply the access to fulfilling on the purpose. The biggest disappointment for 2013 is that I have only reached a fraction of the people I’d like to reach with these gifts. 2014 is about bringing nurturing musical beauty and relaxation to a much larger group of people. St Andrew’s-Wesley United Church is where Quiet Hearts happens every Wednesday. It holds over 1000 people. We finished 2013 with record breaking 36 people in attendance. That was actually a triumph given our average up until then had been more like 12 people. My goal for 2014 is 750 people in attendance at the final concert for that year (we want to keep the balcony and some of the side wing seats clear of people, so I’m not going for 1000 people). Given we have numerous people coming back again and again, I’m saying this is possible. I don’t know how it’s going to happen, but it is possible. For Under the Piano, I want to make a profound difference for 50 to 100 people who are on a journey of grief. Do you know anyone? If so, please contact me, I have at least 3 scholarships available for people who are in this position in life right now. The scholarships are provided by the generosity of past clients. I call this the Dharma Added Effect which I adopted from the wonderful Shawn Bearman of Radical Ideas. To finish the year 2014 with results like that would be a powerful expression of my purpose fulfilled. Here’s to a year where all our purposes are fulfilled. resumes Wednesday, January 8th at 4:30 pm. …and on through to June when we review the schedule with the church. I know Christmas is barely over, but Valentine’s Day will be here sooner than you can blink an eye. 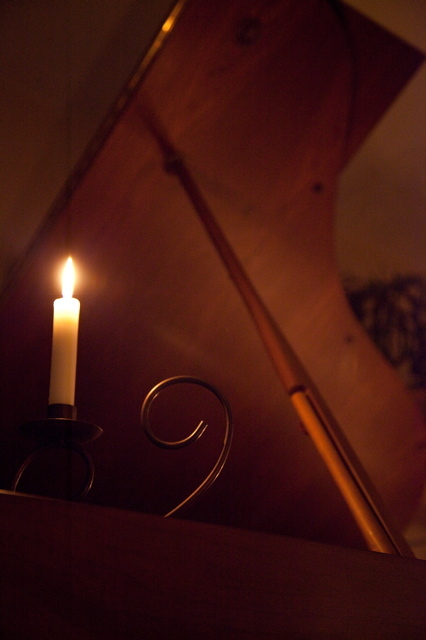 Surprise your sweetheart with a gift that will provide lasting memories and pleasure – an Under the Piano session. I’m considering special packages as we speak and will let you know as soon as I have made some choices on those or call me to create your own unique package with me. Great insights here Craig. I wish you great success in fulfilling your purpose throughout 2014. 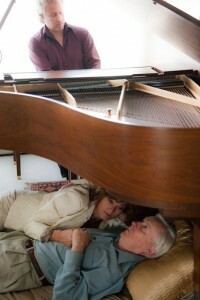 Having experience Under the Piano for the first time this past year I can say that you do provide nurturing and healing. Hello Gregg, thank you for sharing tangible evidence of my purpose fulfilled : ) Wishing you a wondrous 2014.